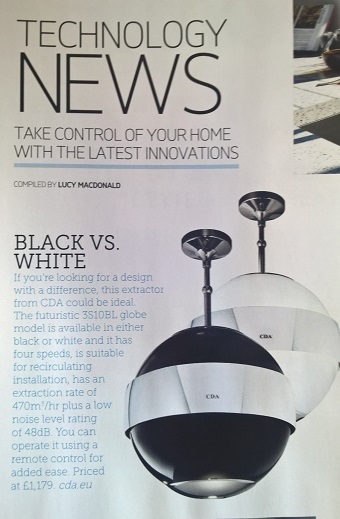 Essential Kitchen Bathroom Bedroom magazine’s August edition features the brand new CDA spherical extractors as part of their Technology News feature. With stunning looks, a super quiet noise level and remote control the 3S10 makes a stylish focal point in any kitchen. 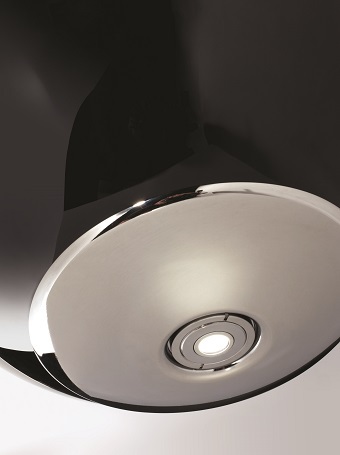 “If you’re looking for design with a difference, this extractor from CDA could be ideal. The futuristic 3S10BL globe model is available in either black or white and it has four speeds, is suitable for recirculating installation, has an extraction rate of 470m3/hr plus a low noise level rating of 48bBA. You can operate it using a remote control for added ease.” from Essential Kitchen Bathroom Bedroom magazine’s feature Technology News, take control of your home with the latest innovations; compiled by Lucy Macdonald.